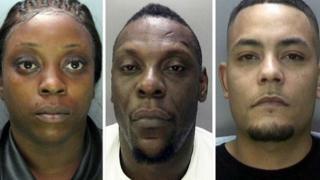 Three people have been jailed for importing blank-firing guns and converting them into weapons. They bought 43 replica pistols for about £150 each and 1,160 blank firing cartridges from an online replica handguns. Following conversion each firearm was sold for approximately £1,500. Carlington Grant, Khianna Lewis and Jermaine Dornan were found guilty of two counts of selling prohibited firearms. They were also convicted of possessing or acquiring ammunition. Grant, known as "Mad Dog", 41, of Johnson Street, Wolverhampton, was sentenced to 26 years at Birmingham Crown Court. Lewis, 34, of Columbus Avenue, Brierley Hill, was sentenced to 17 years. Dornan, 30, of Temple Street, Wolverhampton was also convicted of supplying cocaine and was sentenced to nine years in jail on Wednesday. The court heard how Grant and Lewis funded the purchase of the guns and ammunition from a firm in Calais before converting them. Officers spotted two semi-automatic handguns being handed over in a shoe box in a Kingswinford supermarket car park. Serial numbers on the guns led officers to the firm in France which had legally despatched them as part of a shipment to an address in Cornwall. Grant and Lewis made four trips to Cornwall to collect the guns before storing and converting them at a unit on the Black Lake Industrial Estate in West Bromwich which was later raided by police. In May last year another of Grant's converted pistols was dropped during an armed raid on a carpet shop in Tyburn Road, Erdington, police said. Warren Stanier from the CPS said: "Their illegal activities have put innocent members of the public in danger." Speaking following sentencing, Det Con Rory Juss, said that Grant and Lewis used the money to "fund a lavish lifestyle of luxury cars and regular trips abroad". Gun crime: How do weapons appear on England's streets?